I have a busy Tuesday and Wednesday this week, so I haven't had much blogging time. I also didn't get outside to take pictures in the gardens. Most of the flowers I posted last week are still blooming, and the tomato plants have a few flowers. 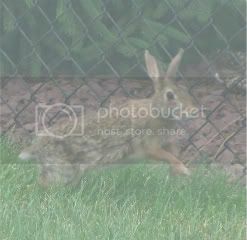 On Monday I saw Hoppy running along the fence between our yard and our neighbors' yard. By the time I got the camera, he was on our side of the fence. At least the Hoppettes seem to be staying on the outside, so far! I expect to be back on Thursday with a regular post! Wow that is a very big rabbit!